19 out of the 31 registered boats came to the line for the first race of the 2018 season. With the race starting from the new Marconi race box, it was a chance for race officer Paul Su to try out the Formula 1 style lights and countdown. 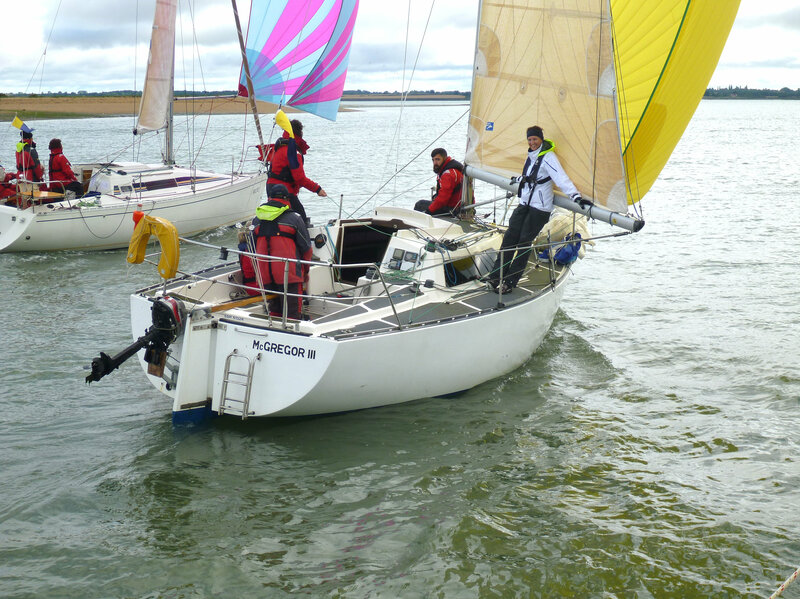 The weather forecast had been extremely variable prior to the start and Paul set a short 2 loop estuary course of BAR, IBH, BH, aware that lighter winds and rain were most likely – little did he know how light and how much rain! Wind changes proved to be the order of the day right from the start, as those preparing for a spinnaker start with a SW wind, suddenly found themselves close hauled towards the start line and beating into an easterly. McGregor III had guaged the 2kt tide well, and was first away despite having returned to shore to drop off an injured crew member. Nice Tri had to sail wide angles to make No6 and eventual gave up her lead to Tigo IV as they approached the Bench Head. On the second loop, Blue Moon’s spinnaker gybe at the Inner Bench did not go to plan and Moon Shadow, McGregor III and Aloha steamed past. Then the wind went missing……. The first 6 boats just made the tide gate and hoisted spinnakers for the run home, but many were left struggling around either the Inner Bench or fighting back to the Bench Head. With little prospect of wind, and an increasing flood tide retirees started to come thick and fast. Much radio chatter to find out if there was any wind to be found anywhere!